A new dementia index tool can apparently classify 88% of patients who will develop dementia in the next 6 years. Of course, there is still nothing you can do to prevent or truly treat dementia, but at least you can enjoy your remaining dementia-free years and hope for a cure, right? However, it only works if you are over 65; wouldn't have helped my dad (diagnosed at age 62). 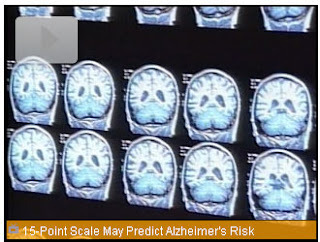 A 15-point index including both conventional and newly identified risk factors for the conditions correctly classified 88 percent of patients according to their risk of developing dementia within six years. Every 70 seconds, someone gets dementia. That's depressing. He was not of older age or underweight and he drank beer daily. He did not have heart problems until a year before he died and he put on a button shirt every day until he retired. The test is not perfected and not available for general use yet. This is great, thanks for posting. I don't have HBO and rely on others to learn what they are airing. Thank you! Will continue to stop by from time to time. My moms docter took an MRI and said there was lots of skrinage to her brain. He showed us all the parts that were affected by alzheimers. I wish we had of had something done sooner.